Under counter pharmacy cabinets are built using 3/4" MDF in white color. All Rx cabinets measure 24" wide x 24" deep x 38" high, including a 5" high black toe kick. 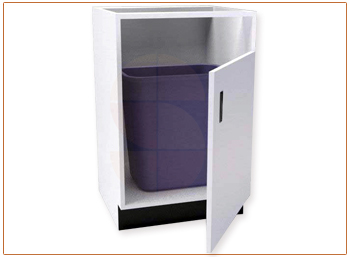 The waste unit holds a trash bin or waste container hidden from view. The door has an opening on top for convenient trash disposal. Door has a pull handle.